Our open basement bar, fully stocked with Soju and beer, is the perfect place to either relax after a long day exploring Seoul or to prepare for a big night out in Hongdae. Our staffs can make recommendations on the best places to go! Traveling Alone? No problem. Every night travelers get together in our basement bar and head out to Hongdae. The staffs are even known to join in some nights. Authentic Korean food: Join us for our weekly Friday Korean BBQ dinner with unlimited Soju and our home cooked weekday meal. 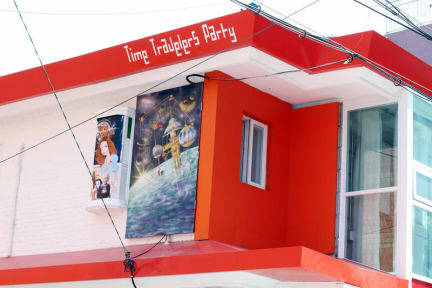 Fun Area: Time Travelers is 7-minute away from the Hongdae area which is known for its hip bars, numerous clubs, amazing food, and live street performances. Convenient Location: Time Travelers is 5-minute away from the Hongik University Subway Station and the Airport train line (Incheon International and Gimpo Airports), Line 2 and Gyungui lines making it easy to get here with a suitcase and a great jumping off point for many other attractions in Seoul. We provide free Wi-Fi and hair dryers. Lockers are available for a flat 1,000 won, with a deposit of 10,000 won. We also provide a laundry service for only 3,000 won. 1. Check in time is after 2 pm and check out time is before 11 am. 2. Both cash and credit card payments are acceptable upon check in at the property (10% additional charges will apply if pay by credit card). 3. Cancellation policy: At least a 7-day notice prior to the arrival date is required for free cancellation. If it is within 7 days from the arrival, we will charge the full period amount. 4. The reception is open from 9 am to 11 pm. The best hostel in my travel in Asia. Will come and stay longer again. I really enjoyed my time in this party hostel. Thanks to all the people I met there. Will be back soon again. Instead of staying for 2 nights, I sayed for a week! Good location, and they have a description of how to get there from Hongik University Station. This helps a lot because most of the maps apps are not working properly in South Korea. The staff is very helpful and really friendly as well. On my last day we had a free lunch cooked by the owners mum - it was amazing! This & the bbq were the highlights. It’s a great place to meet people if you’re traveling alone, especially on the weekends! Such a fun hostel! If you love a drink and good company then this is the place! Met some wonderful people and the staff was amazing! Next time I will definitely stay for the thursday foodmarket tour and the friday bbq! Loved my stay here in the female dorm! Instantly made friends with the girls. The staff were super friendly and helpful (cheers!). Only got to stay 1 night, but would have loved to stay longer. Location is perfect to go out in hongdae, and close to the subway so you can get pretty much anywhere easily. Bathrooms are fine, beds are comfy, and decor is cool. The bar is the common space. Had there been more people when I stayed I think the atmosphere would have been better. Thanks for everything! Great place to stay, you’ll definitely make good friends and have a great time. The facilities are a little run down but it’s a well loved place.